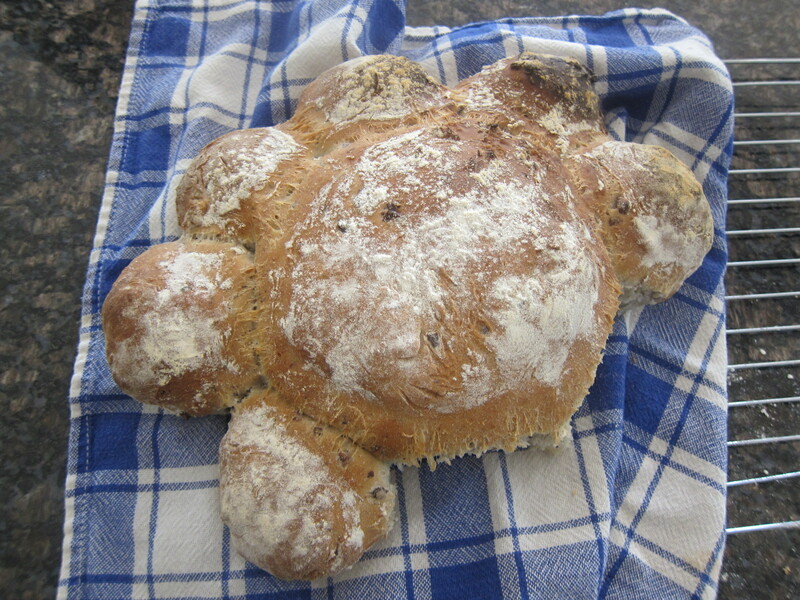 I am so glad I tried this – it’s the loveliest bread I’ve had in ages. It is so soft, yet the outside is firm, and the olives in it are really good – not too olivey, but enough to make it different. It is so quick to make, hardly makes a mess thanks to the thermomat, and looks really impressive. 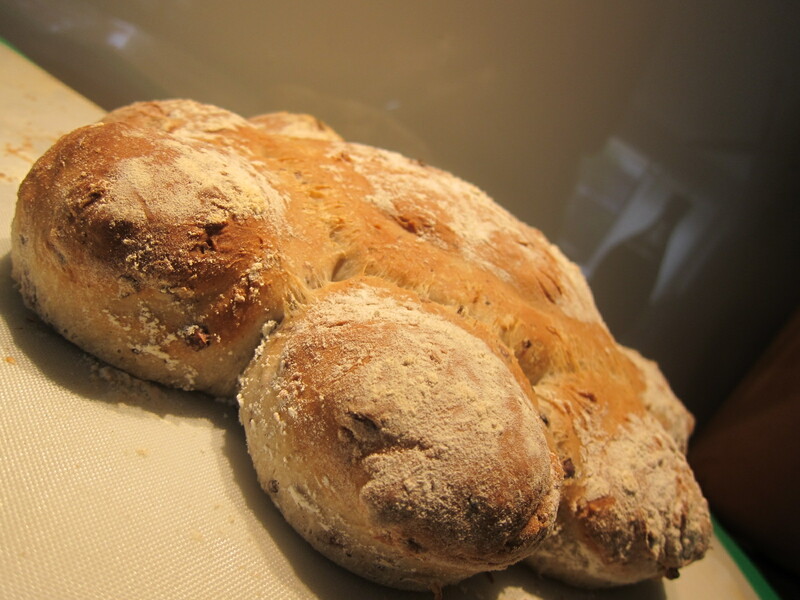 It would be great to pull out of the oven when friends come over for a barbecue, but don’t prepare too much other stuff, as everyone will eat themselves stupid with this bread – it really is that good! This recipe comes from Nicolas Poelaert who is the chef at Embrasse in Melbourne. I’ve never been, but now I’ve tasted this – I want to!! The best thing about this recipe is that you would certainly have all the ingredients in your cupboard. I always have a jar or two of olives in the fridge, and I used kalamata olives for this recipe. They worked well, but the resulting bread was just a little too salty for mine – so I might drop back slightly the 20 grams of salt next time. Maybe try 15 grams or so. I would much prefer salty bread to unsalted bread though. I did find the dough quite sticky, and I think it might be the wetness of the olives. So next time, I’ll add maybe 520 grams of flour, plus have some more on hand to dust. It’s the first time I’ve ever had really sticky dough from the thermomix, so don’t be too worried if yours is the same. Just throw some more flour into the dough when you tip it out of the bowl. You don’t have to cut the olives, just make sure they are pitted and then kneading action of the thermomix will cut the olives down into nice little bits without you having to do anything. I used the baker’s flour, as specified in the recipe, so make sure you use the right flour – it does make a huge difference to the outcome. Which reminds me – everyone knows the trick to getting dough out of the thermomix, don’t they? Invert the TM bowl, and twist the cog in the middle to rotate the blades – and most of your dough will come out in one fell swoop. 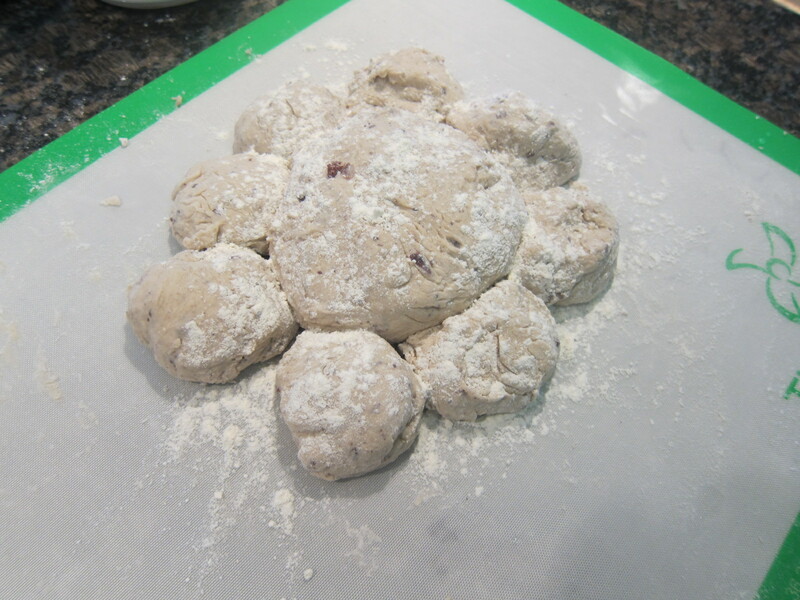 Any stubborn little bits can be ‘turbo-d’ off the side, and use another piece of dough to pick up the little bits. When you’re washing the TM bowl, use the brush and only use cold water to wash until all the dough is out – it makes it so much easier. If you don’t have a thermometer something similar, this is why you need one!! Not only is my thermomat my saviour at play dough time (and the Thermomix makes fantastic play dough), it’s perfect to use when proving dough, and to cook the dough. 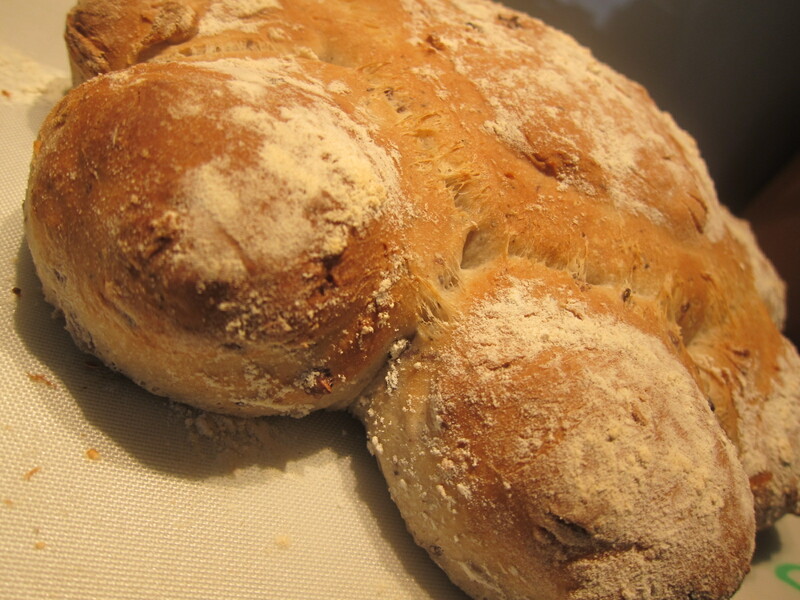 With this recipe, you shape the bread, let it prove in a very very very low oven for`45 minutes and then cook it – see the recipe for details, all on the thermomat. Nothing could be easier, and less messy. 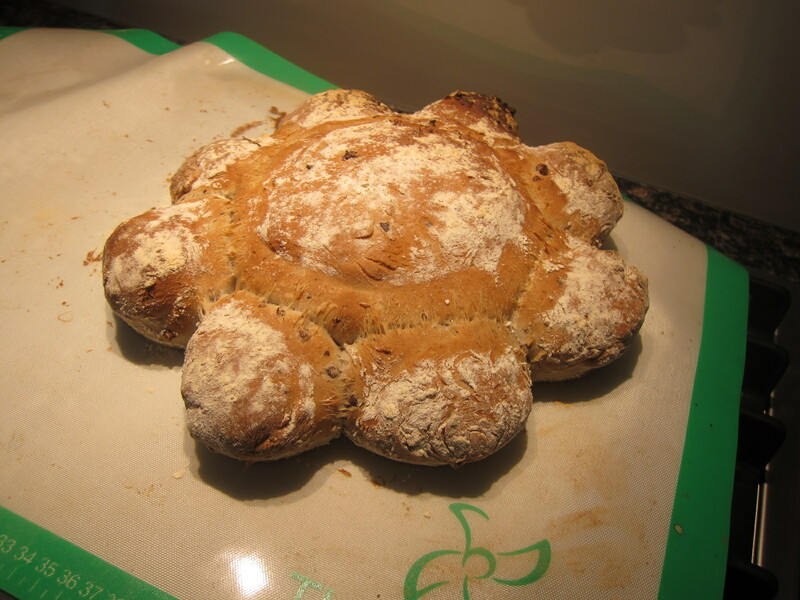 I dud more than the seven balls of dough, and did one large one in the middle, and put several around the outside, just like a flower and petals. You could do rolls all the same size, or vary them, like I did. I guess you’re only limited by your imagination as to what designs you can come up with. Before you put it in the oven to prove, sprinkle it with a little flour. Mine took just on 15 minutes to cook, but keep an eye on it, depending on your oven. I have made bread before in the thermomix, but as we don’t go through a lot of it at our house, it has never been at the top of my list for things to make. 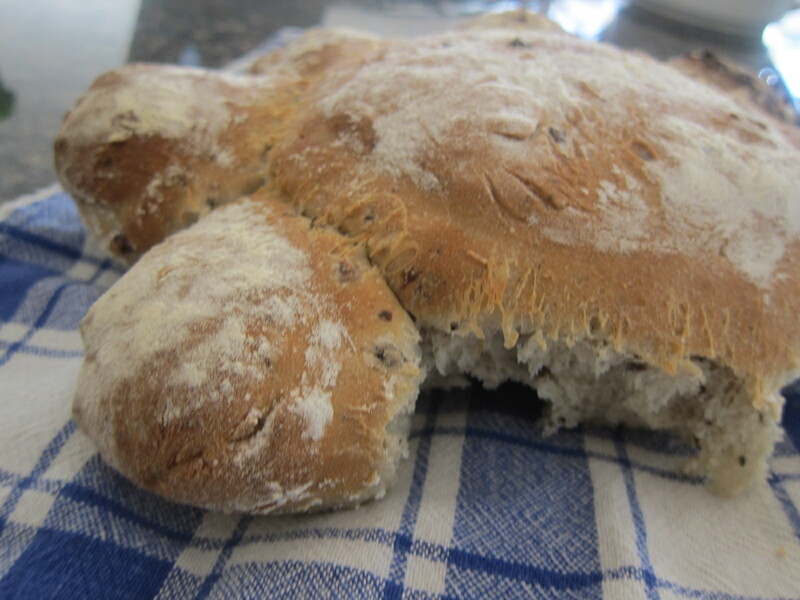 I can see myself making this bread lots – Master Three has just downed two of the little rolls (and that after his lunch!!) and I’ve had one or two myself.